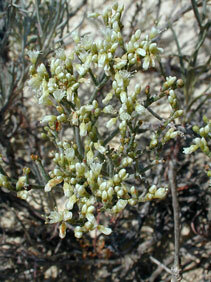 Eriogonum effusum Nutt. var. rosmarindes Benth. Stems: Erect from woody or semi-woody base, shrubby, white-woolly; bark exfoliating. Leaves: Alternate, simple, overlapping, linear to narrowly oblong, less than 4/5 inch long, entire, edges often rolled back toward lower side, sparingly woolly above, gray-woolly below, base narrowed to stalk. Inflorescences: Cyme-like, compound 5-7 times, branches nearly erect, somewhat flat-topped; bracts scale-like; flowering stems up to 2 inches long, leafy for about half their length, glabrous or woolly-hairy. Flowers: Involucres sessile or short-stalked, top-shaped, about 1/10 inch long, glabrous or woolly, teeth rounded or pointed; perianths white or pinkish, glabrous outside; perianth members 6, united basally for about 1/3 of length, petal-like, in 2 series, outer 3 members wider than inner 3 members; stamens 9. Fruits: Achene, 3-angled, glabrous, 1-seeded. Habitat: Chalk-flat, mixed-grass prairies; dry soils. Distribution: Only in the central portion of the west 1/3 of Kansas. Comments: A variable species endemic to a few western Kansas counties.